1.2.2 英語放送 スクリプト編: JR東日本 (特急・新幹線) - dutcheez’s Fun with English! The stop after Kashiwa, will be the Ueno terminal. Ladies and gentlemen, we will arrive at the Ueno terminal in a few minutes. Passengers changing to the Tohoku Shinkansen, the Yamagata Shinkansen, the Akita Shinkansen, the Joetsu Shinkansen, the Nagano Shinkansen, the Utsunomiya line, the Takasaki line, the Yamanote line, the Keihin-Tohoku line, the Ginza subway line, and the Hibiya subway line, please transfer at this station. Thank you for traveling with us. We look forward to serving you again. Ladies and gentlemen, welcome on board the Tohoku Shinkansen. This is a Yamabiko superexpress bound for Tokyo, with stops at, ***, and Tokyo. Passengers without seat reservations, should board cars marked as non-reserved. If you use a mobile phone, please go to the end sections near the doors. The conductor’s room is in car 9. We wish you a pleasant journey. Ladies and gentlemen, we will soon make a brief stop at Fukushima. The stop after Fukushima, will be, Koriyama. Ladies and gentlemen, we will soon be arriving at the Tokyo terminal. Please be sure to take all your belongings with you. Thank you for traveling with us, and we look forward to serving you again. Ladies and gentlemen, welcome on board the Hokuriku Shinkansen. 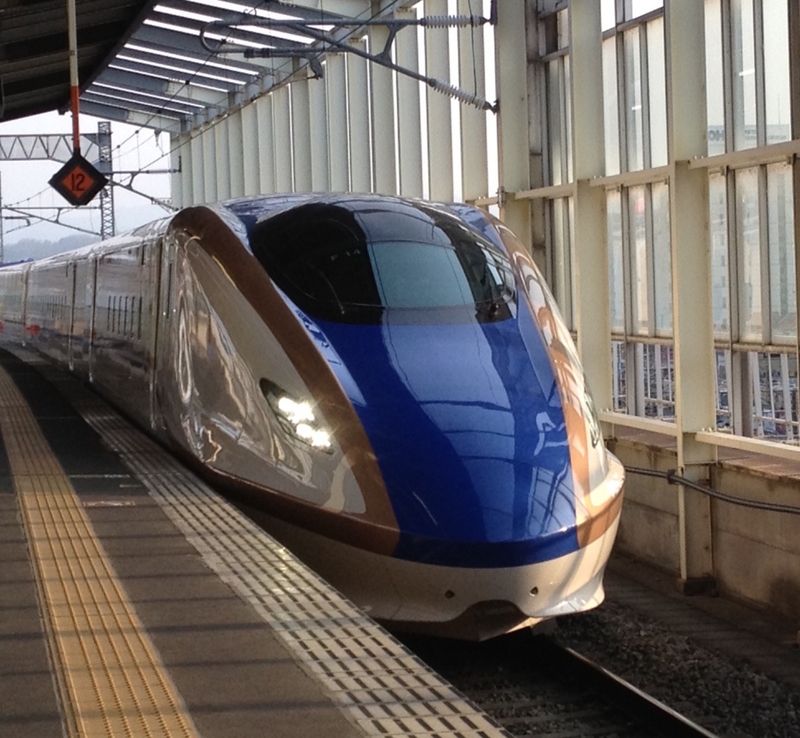 This is a Kagayaki superexpress bound for Kanazawa, via Nagano, with stops at Omiya, Nagano, Toyama and Kanazawa. All seats on this train are reserved. The tickets withstanding is valid for the train and car shown on the ticket. Please do not smoke in this train. If you wish to use a mobile phone, please go to the end sections near the doors. The conductor’s room is in car 6. We wish you a pleasant journey. … bound for Kanazawa, also stopping at Toyama. Ladies and gentlemen, we will soon make a brief stop at Nagano. Passengers changing to the Shinonoi line, the Iiyama line, the Shinano Railway line, and the Nagano Dentetsu line, please transfer at this station. The stop after Nagano, will be Omiya. Ladies and gentlemen, welcome on board the Joetsu Shinkansen. This is a Max Tanigawa superexpress bound for Gala Yuzawa, with stops at Omiya, ...Echigo Yuzawa, and Gala Yuzawa. Cars 1 through 8 will terminate at Echigo Yuzawa; cars 9 through 16 will go on to the Gala Yuzawa Terminal. Wir wuenschen Ihnen eine angenehme Reise.